I’m not a mom but I know the secret to getting your kids to eat their broccoli: Cover it with melted cheese. Anything tastes delicious with some cheese! I do think it’s very cute and I love animals. Especially puppies. And it is a heartwarming story. But I don’t like it because it felt like Budweiser was trying to melt cheddar cheese on my broccoli to get me to eat it. 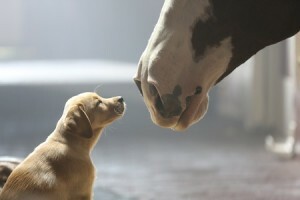 The sappy love story between a puppy and a horse in a contrived attempt to sell me bad beer made me tear up and my heart pitter patter. They set the stage, included all of our favorite things, and then crescendoed the music. A formula tearjerker if there ever was one. Puppy, beautiful landscape, stunning horses, handsome man, beautiful woman, crescendo music. Cue the tears. For that reason, it comes across as disingenuous. My friend Adora challenged my thinking. Budweiser’s strategy is to show they are American through and through even though they’ve been bought out by a Belgian beverage company. A good strategy since their audience is highly patriotic and wants to see that, but how will do they convey that message? By telling a story of a cute puppy and horse with some crescendo music with a sub-plot of true love between a woman who owns a pet shelter and a farmer? Later in the game, the spot with the soldier who returned from home to a ticker tape parade surprise, paid for by Budweiser made me tear up, yet again. Yes, they’ve managed to move me; I’m not going to lie. And it’s an important message. We all need to be reminded daily of the sacrifices being made overseas. Again, I’m going to argue the execution of the message. Why not show us how you are American rather than tell us how American you are? It feels like you’re sprinkling bacon bits on my salad to get me to eat my vegetables. Instead of creating fanfare for one single soldier to raise awareness why not actually do something to help soldiers returning from overseas? How about something to help them get jobs? Or learn a craft? Start a foundation that creates some kind of platform to help, do good, and then! Rather than funding a big parade to tell a story à la Wag The Dog, you can organically tell a story you created, not fabricated. Hey – you can even put some crescendo music to it. If you want to connect more meaningfully, you have to be more meaningful.